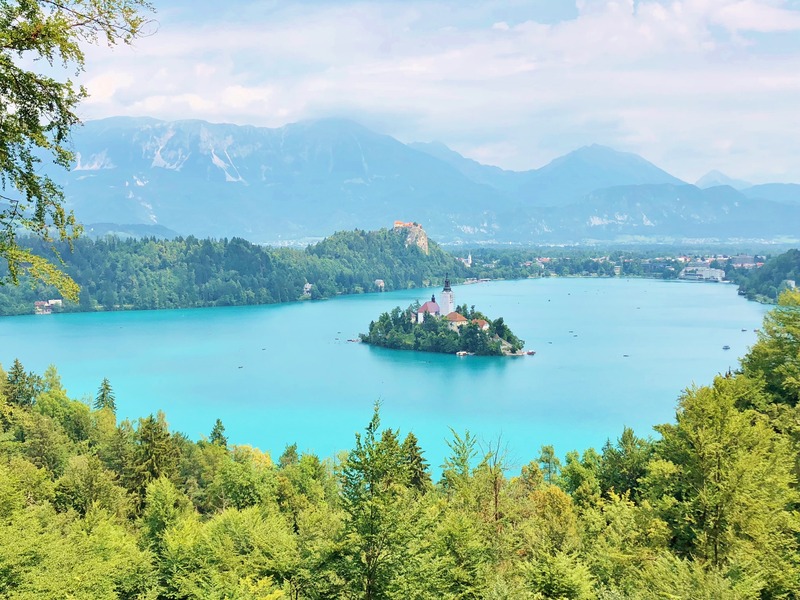 Lake Bled – the turquoise glittering gem of Slovenia – is purely amazing! It is like walking into a fairytale where the breathtaking views soak you in. Even though Bled is a lovely town, in this post I will mainly focus on the awesome viewpoints that overlook the lake. They were the reason I wanted to visit Lake Bled and I wish that I can make you dream about it too. The glittering turquoise Lake Bled in Slovenia! Lake Bled is a turquoise lake in the Slovenian mountains just 30 minutes away from Ljubljana. It is famous for the church located on a round island in the middle of the lake. The best photos of it are taken from a certain viewpoint but there are actually a couple of viewpoints available. How to find the Lake Bled viewpoint? I headed to Lake Bled from Ljubljana by car. It was quite easy to find due to the rush of cars. I must say that the roads of Lake Bled aren’t ready to welcome the amount of travelers that want to visit there during the summer months. If you arrive by car, go around the lake from the left side and drive almost until you see a camping site. Before the camping site turn left for a sandy road that leads you to a parking place. Click here for a Google Maps Street View to find the the road. It’s a bit hidden and seems like a dead end but there is a small place meant for cars to park in. I did the mistake of parking after the camping and it was super frustrating and over priced – don’t make the same mistake. The other option is to drive uphill which requires just a bit of walking. Get prepared – it will be a heck of a hike! The viewpoint is a must-do but be prepared! Take comfortable shoes, no flip-flops, it is steep at some points and slippery and I cannot imagine what the route would be if it rains. Take some water as well – you will need it. The route starts first quite easy but it gets trickier the higher you get. There are roots, sand and plants on your way. Be really careful that you don’t slip! Also the signs aren’t the best ones but there are some of them. Depending on the direction that you come from, there will be some beaten paths here and there that will eventually lead you to the main hiking route. Click here for a Google Maps location. The most common one leads past a couple of houses on a hillside so if you see them, you’ll know you are on the right track. Also if you see non-locals on a hike, you have probably found the way. Steep paths to the viewpoint of Lake Bled – Good shoes are a must! The hike up takes about 40 minutes. I exercise a lot and it was still a real workout for me too. I passed one poor girl who tried to catch her breath halfway the hike and all the people who I saw on the way did breath quite heavily. It didn’t help that it was 30+ degrees Celsius on that day but I’m not complaining. For me the toughest part of the path was the last stairway to the first viewpoint. It was so high for me. But what ended up being the hardest part of the hike was not going up but going down since I have a fear of heights. The hike up to the viewpoint is a good way to burn some calories haha! Let’s talk about the viewpoint then. It is quite small but it has a bench and the view overlooking the Lake Bled is spectacular! I could have spent the whole day there just admiring the mesmerizing turquoise lake and the mountains. There is another viewpoint that is even higher which continues upwards from the first viewpoint. I must say that I got enough by walking to the first viewpoint and I had to head to my next destination. If you have more time than what I had, go up there too since the view will be amazing! The views from the viewpoint of Lake Bled are absolutely stunning! The hike down from the first viewpoint takes about the same time as going up. The path is very slippery when going down so I had to step carefully. There are also nice views along the path to the lake so do stop and take a photo or two. You can get really nice photos between the branches and they can be as good as from the viewpoint. On Lake Bled there is a possibility to hire a boat and row it to the island. There is also a castle on the other side of the lake which is also considered as a great viewpoint if you don’t feel ready to hike to the main viewpoint of Lake Bled. You can also walk around the lake which will give you good opportunities to take photos and enjoy the nature. I could have sat there forever. Lake Bled is one of the gems of Europe and it was the highlight of my road trip! If you are still wondering whether you should travel there or not, don’t wonder anymore – just go! It is a mesmerizing place that will hopefully enchant you like it enchanted me. How did I end up going to Lake Bled? Read my article on making a road trip in Europe! Nice and a useful information report. Thank you. Thank you so much for this great write up on Lake Bled! Just seeing all your pictures is inspiring enough!